Facebook has begun rolling out end-to-end encryption for its Messenger app, thus making its users’ conversations completely private. The end-to-end encryption feature, dubbed "Secret Conversations," will allow Messenger users to send and receive messages in a way that no one, including the FBI with a warrant, hackers and not even Facebook itself, can intercept them. But, this new feature will currently be available only to a small number of users for testing. So if you are one of those lucky users, you will be able to send end-to-end encrypted Secret Conversations through your Messenger app. Rest of the Messenger users will get Secret Conversations feature later this summer or in early fall, the company wrote in a Facebook newsroom post published today. Your conversations on Messenger will not be end-to-end encrypted by default, like what WhatsApp and Apple are offering. 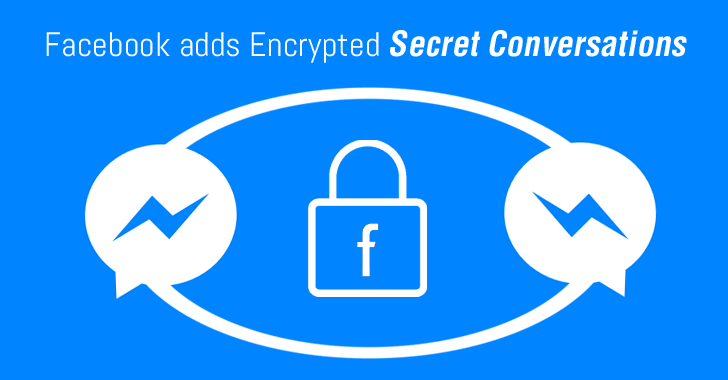 Instead, Facebook will require you to choose between security and convenience, as the end-to-end encrypted "secret conversations" is an opt-in feature, just like Google’s Allo chat app which provides encrypted chat only if users opt for it. Secret conversations will offer Messenger you options like making your conversations self-destruct after a period of time so that a sensitive conversation would disappear after a certain time, say 30 minutes. Also, the messages in secret conversations will be visible only to you and the sender, each of a single device. Also, since Chats in secret conversations will only be viewed on one device, there will be no way to continue chatting in a mobile Messenger app if the message was first seen on the web browser and vice versa. Messenger’s Secret Conversations employs Signal Protocol developed by the non-profit Open Whisper Systems, which has already been used by Facebook in WhatsApp, Google in Allo’s Incognito Mode, and Signal’s standalone app used by Edward Snowden. Reports about end-to-end encryption for Messenger emerged last month, when Facebook was criticised by many privacy advocates who said that the company didn’t want to turn on end-to-end encryption by default. However, Facebook chief security officer Alex Stamos tweeted that the encryption opt-in feature on Messenger was a "small test for now," with an aim to "get feedback from people about what works best."